San Francisco based designers, Crooked Nest, hope to bring peace and serenity to the 9 to 5 by infusing lush greenery into urban workspaces. 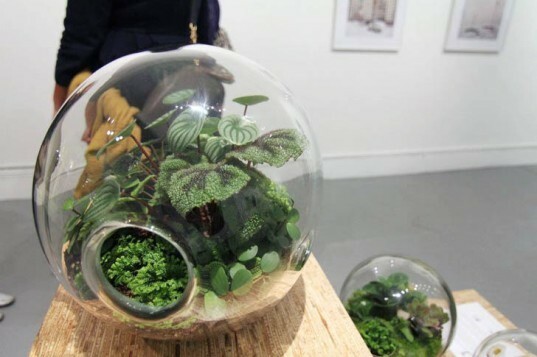 Their gorgeous terrariums bring miniature gardens to desk tops, lobbies, retail spaces and even art galleries. These artful plantings help create a warm environment- and can pop up just about anywhere! Crooked Nest takes their terrariums and living walls very seriously, calling them foliar juxtapositions, an idyllic name for infusing nature into an otherwise devoid space. Rather than battling the concrete jungle, the company re-enlivens these spaces by introducing plants and plant materials. These pieces help nurture with nature- connecting people with the space they work in, as well as one another. Each of Crooked Nest’s bulbous terrariums are artfully made from hand blown glass, made in the San Francisco Bay area. In general shapes of round, squat and tall, each is totally unique thanks to the hand crafting. Around 12 inches in diameter, the terrariums are large enough to afford a lively garden, but small enough to sit on a countertop or desk without disturbing workspace. Succulents, ivy, edible herbs and even flowering plants can thrive in each terrarium, which are easy to maintain through a “hand hole” on the end. You can rely on Crooked Nest’s expert design and horticulture skills and get an inspiring pre-made terrarium. Or, if you’re feeling creative they sell empty glass bubbles, to design your own miniature garden. Crooked Nest understands the power of plants, and provides the tools to have a harmonious space, even in the middle of the city. Crooked Nest takes their terrariums and living walls very seriously, calling them foliar juxtapositions, an idyllic name for infusing nature into an otherwise devoid space. Rather than battling the concrete jungle, the company re-enlivens these spaces by introducing plants and plant materials. These pieces help nurture with nature- connecting people with the space they work in, as well as one another. 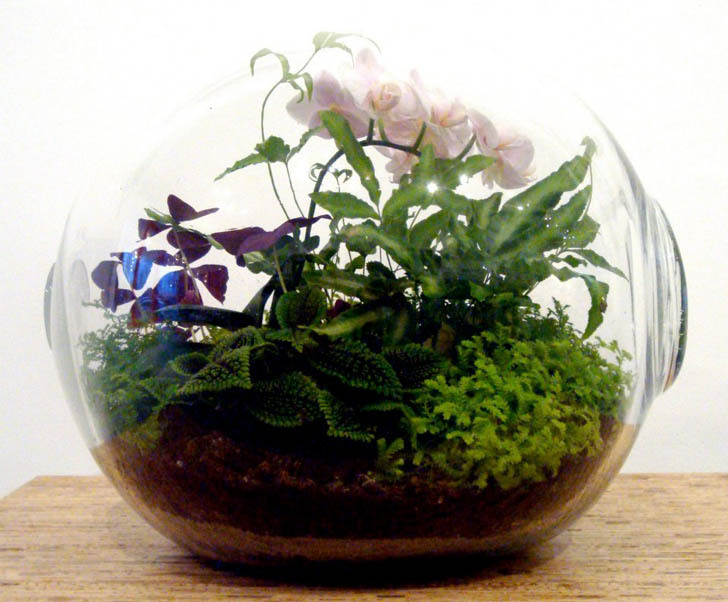 Each of Crooked Nest’s bulbous terrariums are artfully made from hand blown glass, made in the San Francisco Bay area. In general shapes of round, squat and tall, each is totally unique thanks to the hand crafting. Around 12 inches in diameter, the terrariums are large enough to afford a lively garden, but small enough to sit on a countertop or desk without disturbing workspace.